Grease a 9x12 casserole dish. 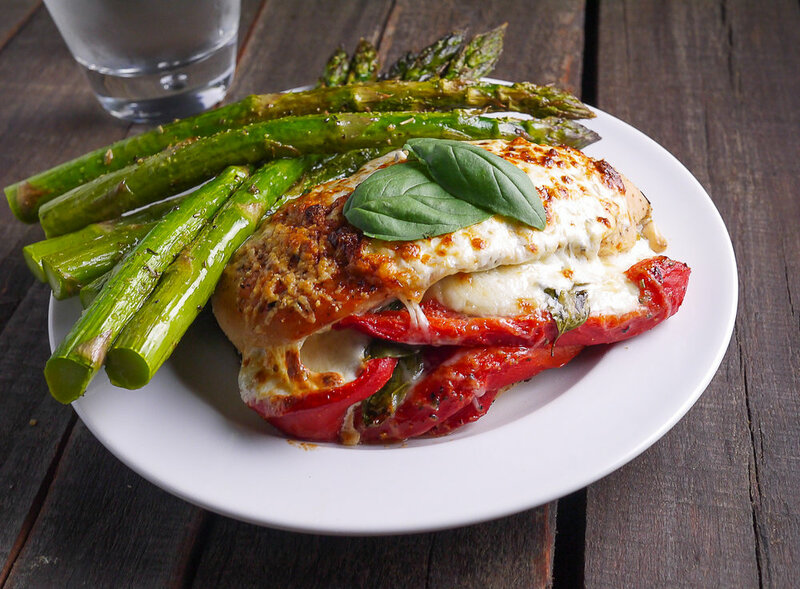 Stack the roasted red pepper, basil, and 1 slice of the mozzarella on the bottom side of the chicken. Fold the top flap of the chicken over, tucking in the mozzarella, basil and roasted red pepper as necessary. Bake chicken for 30-40 minutes (until chicken is no longer pink). Pull chicken out of oven and turn the oven to a high broil. Top chicken with remaining mozzarella slices and sprinkle with Parmesan cheese. Broil until cheese is browned and bubbly, about 5 minutes.